Small schools always struggle with how to manage their technology. Is it worth it for a small school to have a dedicated IT professional on staff or retainer? The irony is that we often have a community of technology guru's swarming right around us - our students. The trick is to figure out how to harness their natural interest in technology to solve problems on campus. GenYes offers a great way to manage and engage students in the technology implementation and maintenance on your campus. The way the system works is your build a network of Student Technology Leaders (STL's). Staff, Advisors and even other students can TAP those students on the GenYes website to ask them to solve a problem - say... fix a projector or re-image a computer. Next, the STL receives a text saying that they have been requested to solve that problem. The student feels empowered! The advisor is thrilled that a student will be solving the problem. And, the advisor can track the students progress..... so that they may earn credit for doing this support work throughout the term. Students and advisors can track student hours. 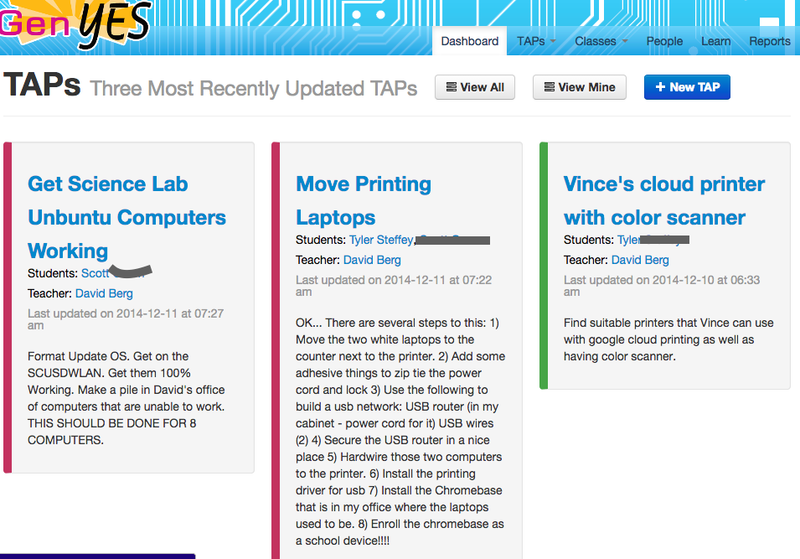 Students can mark when a TAP is complete and the advisor can confirm completion. Students can build up a list of qualifications for technology skills so that others in the community can know what skills to seek for their help. In my point of view, you are doing the best thing for students that I have ever seen. I hope that you will be strong enough to end this at the time. For other, I would recommend some new services, that would like to help you with your essay. My favorite is Paperell. Cause only they know all about writings and the authors are very fast, clever and polite! As a student I confirm that the culture of technical support is really out of order. But pleasant exceptions also happened with me. Recently, I needed help with my business desertation titles and I turned for help here, and I really liked how support works there.I hope such a high level of service and technical support will be everywhere someday, but today it looks like an exception.